Home Topic of Week Why We Affix Revenue Stamps on Cash Receipts /Payments ? 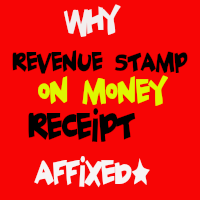 Why We Affix Revenue Stamps on Cash Receipts /Payments ? Have you ever thought for a moment why we affix the revenue stamp while making payments in cash of Rs 5000 (five thousand) or more. Or when you are required to receive any receipt for cash payments or even by cheque, exceeding Rs 5000 or more , non affixing the revenue stamps will make it worthless as far as legal value of the document is concerned.The common example is rent receipt in which case you , many times , you pay in cash or even by cheque. As per Section 3 of Indian Stamp Act , certain receipts/instruments and other documents are required be affixed with revenue stamp .The list of such receipts ,documents along with value of stamp to be affixed is given under Schedule 1 Indian Stamp Act . Previous articleSection 56 : Income from other sources. Next articleMAT Credit u/s 115JAA Simplified !